Your home or business's shading and window treatments can be integrated into an overall centralized control system, automating their movement thus making them completely effortless. Motorized shades can be programmed to suit your needs, for example when you press the DVD button on the display's remote, the shades are automatically lowered. Or, your shades can be lowered just before the sun is about to enter the room, thus reducing energy usage and preventing UV damage to flooring and furniture. Shading can also be utilized as a setting for when you leave on vacation. Motorized window treatments allow for effortless control of natural light and are nearly silent when in operation. Whether a window has roller shades, roman shades, or drapes, we can design an appealing solution for your home. 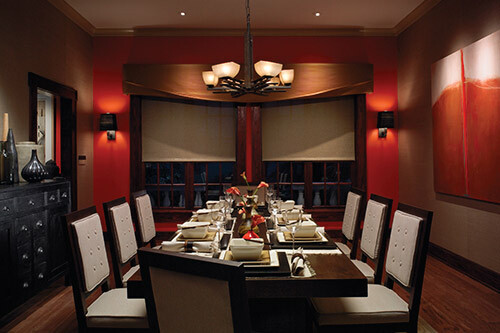 Our shades come with a wide range of fabrics and we can incorporate custom material. Including a shading system into your home or business helps automate lighting levels, guards interiors against ultraviolet damage, and conserves energy usage.